The Gorkha Janmukti Morcha today said it would not support the country-wide bandh jointly called by the Left Front and the Congress on September 2 to protest the central government’s labour law and reforms that allegedly curb’s workers’ rights. GJM general secretary Roshan Giri issued a press statement to announce the party’s stand. “Being the principal political party in the hills, it is our responsibility to maintain the peaceful atmosphere that is presently prevailing. 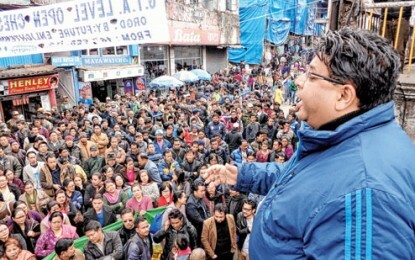 Also, we feel that bandhs will hamper the ongoing development work in Darjeeling,” he said. The trend in the Darjeeling hills has been to ignore strikes whenever they are called by mainstream political parties whatever be the issue. However, political analysts are of the opinion that the GJM does not want to antagonise both the BJP - its political ally - and the Trinamool Congress, with whom it has come close again. The GJM-affiliated Darjeeling Terai Dooars Plantation Labour Union (DTDPLU) also said it would not support Wednesday’s bandh referring to the BJP as an ally. “The GJM is part of the NDA government at the Centre. Moreover, we have our own issues that are being discussed with the state and the Centre,” said DTDLPU spokesperson Milan Pradhan. The Left Front’s strike call is being supported by several trade unions including that of the Congress party, alleging the Centre’s policies were anti-worker and leaning more towards the corporate sector. The DTDPLU is presently in a pact with the John Barla-led Adivasi Vikash Parishad of the Dooars to push for its own demands. “On August 22, we held a meeting with the AVP to take forward our demands related to tea garden workers of the hills and the plains from September onwards. It will be difficult to extend any support to the Left Front and Congress called bandh,” Pradhan reasoned. GJMM, DTDPLU not to support country-wide bandh on 2 sept, The Gorkha Janmukti Morcha today said it would not support the country-wide bandh jointly called by the Left Front and the Congress on September 2 to protest the central government’s labour law and reforms that allegedly curb’s workers’ rights.